When I was growing up, there was always someone in my town that everyone knew. You saw him on your way to work, when you went to the mall, walked to school, or went out to get groceries. He was always seen riding his bike with a backpack on and wearing a baggy pant/army jacket combo that swallowed him. His name was Cornelius, and he was homeless. We see homeless people every day of our lives. So often so that it has just become a part of our daily routines. You get up, shower, get dressed, leave the house for the day, take a walk or get in your car, pass a homeless person on the street corner asking for food or money, get to your destination, do your thing, see more homeless people on the way back to your house, so on and so forth, and you never look back. But have you ever wondered about the people that do look back? The ones with so much compassion for people that they help whenever they can? The ones that look forward rather and don’t turn a blind eye when they see them? I have. There’s always been a part of me that’s wanted to help but wasn’t sure how. GradGuard, though great for insurance, has a heart of gold when it comes to caring for others. 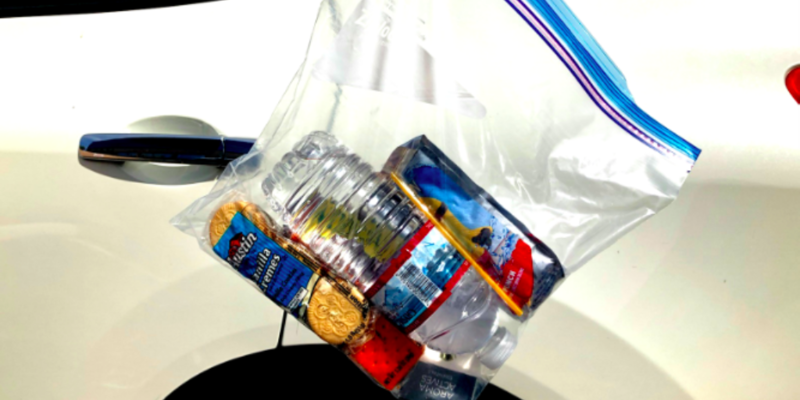 GradGuard actually has a system where they fill Ziploc baggies with different kinds of snacks and bottled water to have on hand in their vehicles to give out to the homeless population of Phoenix, Arizona. If you have ever been to the south-west, especially in the summer months, it can be pretty brutal just walking out the mailbox, let alone having to spend all of your time outside because you have no shelter or water. Something as simple as handing one of these bags to someone when you’re stopped at a red light (and want to send out some good karma) can really brighten someone’s day. 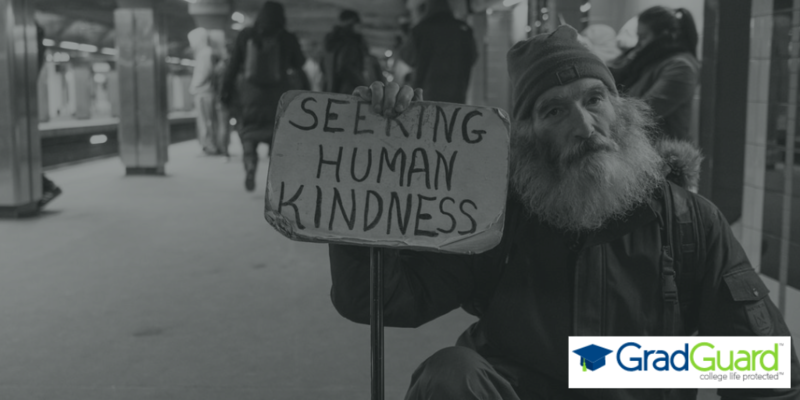 Upon seeing so many homeless people around the area and on our way to work, the employees of GradGuard just felt that there was something that could be done about it. We heard about creating these care bags just by word of mouth and decided to start making some of our own. 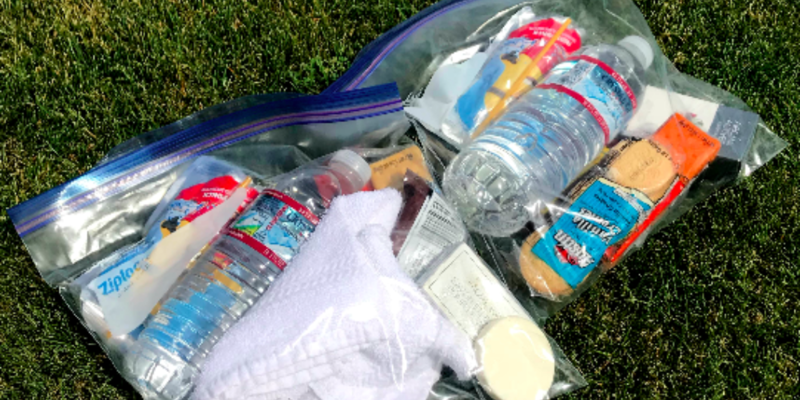 The co-founder of GradGuard, John Fees, his children have been making the goodie bags in bulk that we hand out to those who need them, and we encourage you to do the same. It doesn’t have to be a lot, but maybe next time you’re cleaning out the pantry, instead of throwing away that box of granola bars you didn’t eat or the flavor of fruit snacks that the kids didn’t like, make a few of your own bags to hand out to those in need. Maybe we can start a wildfire of good vibes and help some people along the way; after all, changing the world happens with one act of random kindness at a time. GradGuard’s team is dedicated to, not only helping students succeed but community members as well. Since its founding in 2008, GradGuard has protected more than 600,000 college students and their families. GradGuard is the national leader in providing tuition insurance and renters insurance to colleges and universities and the students they serve and the GradGuard Care Bags demonstrate the type of people who help fulfill our promises to protect college life. We are currently hiring! If you enjoy giving back to others and having a little fun along the way, please consider joining our team by visiting www.gradguard.com/careers or our page on LinkedIn. Three Cheers for Our Interns! 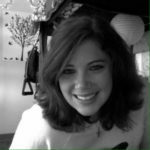 As GradGuard's Customer Advocate and Team Lead, Stephanie prides herself on being writer and a people person with high levels of approachability and excitement who is eager to learn and teach others. Her interests include, running, reading, and not taking life too seriously. New Search Tool Makes It Easy to Find College Student Insurance Three Cheers for Our Interns!